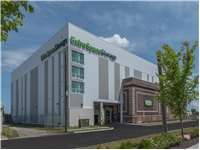 Located near the intersection of S Haven St and Boston St, Extra Space Storage serves Baltimore residents near Brewers Hill, Canton, Highlandtown, Greektown, Medford-Broening, Point Breeze, and more. Locals will recognize our facility just east of The Shops at Canton Crossing. Extra Space Storage on S Haven St can accommodate residential and commercial storage needs in Baltimore near Brewers Hill with a variety of storage units, climate-controlled storage, and more! Units at our S Haven St storage facility come in sizes 5x3 to 10x35 and include convenient features like indoor access, first-floor access, and elevator access. We make it easy to store items large and small! With excellent security measures like 24-hour video surveillance, you can store valuable items with peace of mind at Extra Space Storage. Protect sensitive items year-round at our Baltimore storage facility in a climate-controlled unit! These units stay between 55 and 80 degrees, keeping your belongings safe from extreme heat and cold. Not only does Extra Space Storage maintain a secure, clean facility at all times, but our customer service is also the best in the business! Our professional, friendly team truly cares about your satisfaction and is more than happy to help you whenever you need assistance. Contact us today to reserve a storage unit in Baltimore! Drive south on I-895 S. Take Exit 12. Merge onto E Lombard St. Turn right onto Bayview Blvd. Turn right onto Eastern Ave. Turn left onto S Haven St. Our facility will be on your left just after Boston St.
Drive north on I-895 N. Take Exit 11A. Merge onto O'Donnell Street Cut Off. Turn right onto Interstate Ave. Continue onto Boston St. Turn left onto S Haven St. Our facility will be on your left. Drive west on Eastern Ave. Merge onto I-95 S. Take Exit 57. Turn right onto O'Donnell St. Turn left onto S Haven St. Our facility will be on your left just after Boston St.
Drive east on Eastern Ave. Turn right onto S Haven St. Our facility will be on your left just after Boston St.